with arms. Equipped with padded armrests that can be flipped up or flipped down, this modern office chair provides the convenience you deserve. It's a new age office chair! so guests can sit while they wait. Visitors will be able to choose whether to use them as office guest chairs with arms or without. Something this unique creates a lasting impression! chair or flip them down to use it as an office chair with arms. The back panel even tilts back to prevent neck strains & pains. No other back support office chair is this all encompassing. Your reception room is waiting to be decked out. 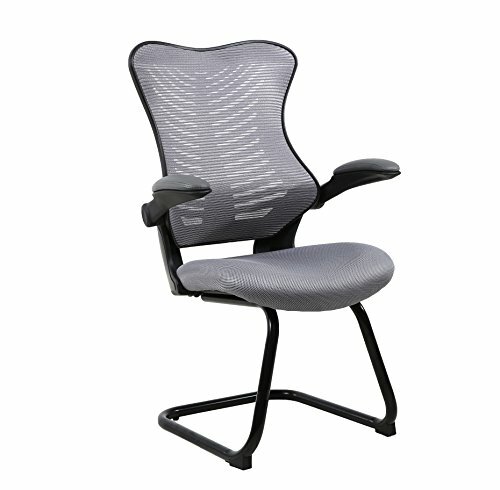 Order your Office Factor mesh visitor chairs today! •CONVERTIBLE FLIP UP ARMRESTS: This heavy duty reception chair by Office Factor features a pair of flippable arms, so it can be used as an armless office chair or as a guest chair with arms. It's the adaptable chair you've been searching for! •PADDED ARMS, CUSHIONED SEAT: While the unique flip up feature delivers convenience, the padded arms & lightly cushioned seat provide your guests or visitors with comfort while they're waiting, filling out forms or taking in a presentation. •ERGONOMIC TILTING CHAIR BACK: Stationary & stylish, our office reception chairs have been finished with ergonomic backs that slightly tilt in order to accommodate different viewing angles. They also caress the spinal curvature to prevent pain. •COVERED IN COMFY BLACK MESH: Our bestselling reception chair for office settings is professionally upholstered with a premium quality mesh material that keeps your guests comfortable. It's soft, extra durable & notably breathable. •PERFECT FOR GUESTS & VISITORS: Given its simplistic shape & versatility, this flip arm office chair makes a fine choice for those designing reception rooms, waiting rooms, focus group rooms, meeting rooms & welcoming centers. If you have any questions about this product by OFFICE FACTOR, contact us by completing and submitting the form below. If you are looking for a specif part number, please include it with your message.